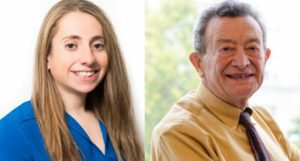 Left: Emily Seelenfreund, current Wolinsky Fellow. Right: Sid Wolinsky, Co-Founder. The Wolinsky Fellowship is an ongoing two-year Fellowship program named in honor of DRA’s Co-Founder, Sid Wolinsky. Preference is given to individuals with disabilities. Fellowships are a crucial lifeline enabling recent law school graduates to pursue a career in public interest law. At DRA, fellows receive stellar mentorship and ample opportunities to work on cutting-edge civil rights cases that better the lives of people with disabilities across the country. For over five decades, Sid Wolinsky has used the law as a tool to challenge discrimination and secure equal rights for people with disabilities. Sid’s vigilance in public interest law and his mentorship to thousands of law students pursuing public interest careers was honored by the California State Bar’s lifetime achievement award, the Loren Miller award, in 2011. This award recognizes his commitment, dedication, and brilliant lawyering, which has impacted the lives of thousands of people with disabilities nationwide. Join us in training and supporting the future generations of lawyers dedicated to empowering people with disabilities. Click here to donate now and designate your gift towards the Wolinsky fund.